Fall is fast approaching but there are two late summer fruits that are just now appearing at farmers markets here in San Diego; nectarines and plums! Both are fruits I adore fresh, but I over purchased on my last trip to the market and needed to use some up while they were at their peak of freshness. This quick, easy flat bread pizza recipe made excellent use of them and was a big hit. This recipe was inspired by some brick-oven pizzas my friend Isabel Cruz whipped up at a dinner to support the American Farmland Trust. I had to do without the brick ovens, but they came out fabulous. I’m sharing the recipe with you here in case, like me, you fall under the spell of the ambrosia-like scent of these fruits and want original ways to enjoy them. Preheat the oven to 400 degrees. Drizzle half the olive oil between the two flat breads and spread evenly to coat well. 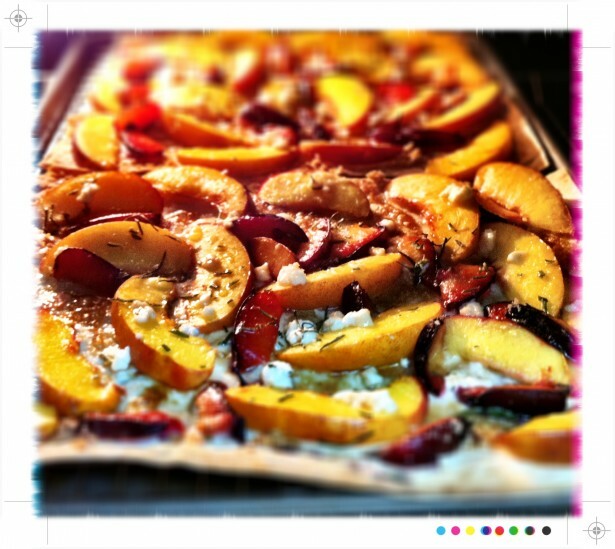 Split the nectarine and plum slices, the goat cheese, the coconut sugar, fresh rosemary and salt evenly between the flat breads. Be sure to take the toppings as close to the edge as possible. Bake the pizzas for 10 to 15 minutes until the edges of the crust are golden and the sugar has started to bubble. You may need to broil for the last minute or two to bring the pizzas to perfection. If you like this recipe, why not join The Delicious Revolution community by subscribing to the news letter or joining our Facebook community. 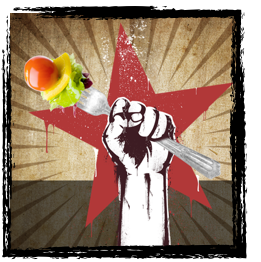 You’ll get free recipes, health tips, and updates on food initiatives. I’m doing my part to reduce printing and paper use. If you must print, select only the ingredients & instructions and copy them into your word processing software so that there won’t be extra colored ink (very toxic) wasted on the photos. Long live the planet.